Pre-Requisites: Access Advanced Level 4 strongly recommended, as you should watch all of my classes in order. However, if you're skipping around, you should have at least completed the Beginner series and the first 3 or 4 levels of the Expert series where I start to cover functions. This class continues our exploration of Macros and Event Handling. We will begin by creating separate BILL TO and SHIP TO addresses in our database. So far, we just have the one address: the customer's main address. What happens if they want to ship their order somewhere else? What happens if they move? Now all of their orders look like they went to the OLD address. So, we'll learn about the importance of storing Historic Data. Where the order went at the time it was placed is important and requires additional handling. 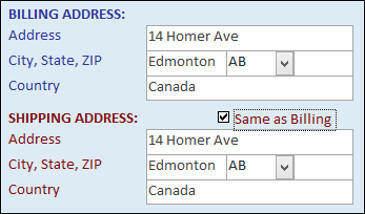 We'll make a "same as billing" check box so we don't have to type in the same address twice. A nice little AfterUpdate macro will handle that. 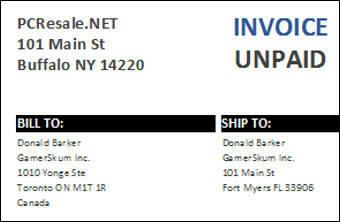 Next we'll add the BILL TO and SHIP TO fields to our order form, and our printed order report. Once the table and forms are set up, the report is a breeze. In Lesson 3, we'll learn about one of Access' limitations: it doesn't support click and drag (drag and drop). This is something I get asked about ALL the time. How can I drag items from one listbox to another. Well, there are 3rd party utilities you can get for that, but I hate using tools that aren't built into Access (why? I discuss it in class). Anyhow, in this lesson I will teach you a workaround. 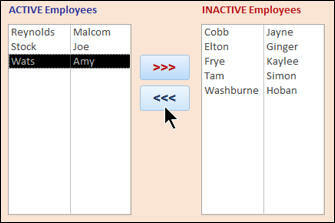 Using two listboxes and a couple of buttons (or a double-click event) I'll show you how to move items from one list to another. We'll learn about the RunSQL command and the SQL UPDATE command. Finally, we'll learn a few things that didn't quite fit into another lesson. We'll talk about the AutoExec macro that will run when your database starts. We'll learn Error Handling in your macros (so you don't see those nasty Access dialogs pop up on an error). 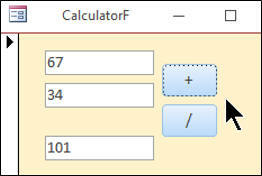 And, we'll learn about the Macro Design tab and how to single-step through macro execution. This is the 5th class in the Access Advanced series. If you're serious about building quality databases with Access, and you want to learn how to automate your database with Macros and Events, which is a good pre-cursor to VBA programming then don't miss out on this course. Of course, if you have any questions about whether or not this class is for you, please contact me. Richard on 4/9/2017: Access Advanced 5 continues our in-depth study of Macros and Event Programming. If you're serious about building quality databases with Access, and you want to learn how to automate your database with Macros and Events, which is a good pre-cursor to VBA programming then don't miss out on this course. Contents include: - Separate Ship To and Bill To - Shipping Address the Same Checkbox - Storing History Data - Move Items Between List Boxes - Access Drag and Drop Limitations - Alternative to Click and Drag - RunSQL Command and SQL UPDATE - Macro Error Handling - AutoExec and Macro Design Tab - Lots more Click here for more information on Access Advanced 5, including a course outline, sample videos, and more. This course was recorded using Access 2016, but most of the topics covered are valid for all versions of Access from 2007 on. This class follows Advanced Level 4. The next class in the series is Advanced Level 6. I'm sure Rich mentions this in a video, only a couple more then onto the Developer, if there are any requests for other Macro topics he'll go back and add more.